1. Buy the single session! FREE access to 40+ live classes over the next year! Unlimited access to 200+ on-demand courses in our library. PLUS exclusive coverage skills tests, Q+A sessions w/instructors, discounts on our conferences and more! The DISC personality behavior model is an effective tool that allows you to quickly establish a positive connection. Can't make it Thursday? Register now and we'll send you the recording. Get access for just $29! Become a monthly member and get access to this course, PLUS our library of 200+ on-demand courses! Have you ever wished a sales person would just cut to the chase and tell you how much an item costs? Or have you ever made a significant purchase from someone only to wonder after the sale, "Will they even remember my name tomorrow?" People buy from you when they like and trust you – aka "connect" with you. 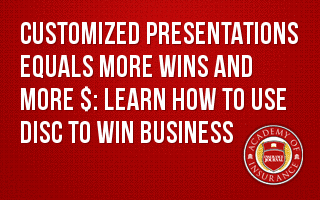 Even the best proposal may be quickly dismissed if you are unable to "connect" with the prospect or client during your presentation. One of the most effective means of connecting with a prospect or client is to communicate to them in a way that meets THEIR communication preferences, not necessarily yours – this includes new and renewal proposals and presentations. The DISC personality behavior model is an effective tool that allows you to identify your customer's preferred communication style - quickly establishing a positive connection. Once you understand your client's preferences, you can tailor your presentations and target your message to meet their needs. In this 90-minute webinar, we offer you tools that you can immediately implement to identify customer priorities and improve the effectiveness of your presentations.